Shredded Lettuce. we woke up to violent thunder and lightning at about 5 this morning. i had almost drifted back to sleep when the rain started -- this was no gentle spring shower. it was a downpour. with hail. not large hail, only about the size of cat food kibbles, but it was big enough to shred the lettuce in the garden. bleah. i suppose i'm thankful that was the worst of my damage. other texas gardeners had more. Spring Cleaning. valentine's day the is 'traditional' date for pruning roses in houston, but i didn't prune my rose then 'cuz the weather was overcast and drippy. however, the across-the-street neighbor did indeed prune his many roses that weekend. yesterday i finally took care of my one lonely rose. it has many bud eyes ready to sprout, along with a bit of new growth, so i'm hopeful that it will be more productive this year than it was last year. the rose came with the house so i'm not really sure what it is, although i kinda suspect it's a hybrid tea rose. my major accomplishment this weekend was completing the eradication of the mock indian strawberry (duchesnea indica). some gardeners are more tolerant (last reader question on the page) of this pest than i am, but i also think my infestation is more aggressive than hers. to be honest, there wasn't / isn't much else growing in the corner (approx. 15' x 7'). formerly the location of a children's playset, the ground was bare and compacted when the previous owners removed the playset in august 2001. we didn't do anything to encourage proper grass and i was actually grateful for the cover provided by the mock strawberry. but lately it has started encroaching on the 'real' grass so i decided it had to go. since last fall, the st. augustine grass has been slowly creeping into the spot and several lawn violets of unknown variety (viola ??) have popped up so it doesn't look as bare now that i've weeded it. Pineapple Sage. the pineapple sage (salvia elegans) by the back door has gotten huge -- and bloomed continuously for months now. it was crowding out the butterfly weed (asclepias tuberosa), so i felt that the pruning of the sage was in order. i didn't want to just throw away the trimmings -- ok, i would compost, not throw away -- but two people can only use so much garnish each day. so i went surfing for recipes and decided to try a banana pineapple sage smoothie. yummy! i left out (forgot) the cinnamon and added a bit of cranberry juice. i've made three of these smoothies in the past week and like them as much as anything i've ever been served at the smoothie joints around town. more sage remains to be "pruned" since i've been cutting only as much as i can use. if i get adventurous this week i might try a pineapple sage pound cake. one of the many reasons i love living in houston is that spring comes early. indeed, what passes for winter here would be considered spring in many places. the japanese magnolias / tulip trees (magnolia x soulangeana) have been blooming for at least the past two weeks here in our neighborhood. we don't have one ourselves, but there are several on our block and if it weren't for the fact that i'd like to put a live oak (quercus virginiana) in the front yard, i'd seriously consider a japanese magnolia. apparently i'm not the only one who has noticed that they're looking especially nice this spring. earlier this week i saw the first redbud (cercis canadensis) in bloom on our block. i'm not sure whether the predominant redbud around here is the eastern (cercis canadensis var. canadensis), texas (cercis canadensis var. texensis) or mexican (cercis canadensis var. mexicana) version. when ours leafs out i'll try to make a more accurate identification. one thing i do know about our particular tree is that it blooms a few weeks later than all the others in the neighborhood, probably because it's in a mostly shady corner whereas the ones i see around the neighborhood tend to be in sunnier spots. the azaleas are getting started -- our two tiny azaleas are covered in buds. several folks on our block already have azaleas going strong, but all are larger / sunnier bushes than what we have. i did notice yesterday that one of ours is now showing some color in the buds -- hot pink. the river oaks garden club's 68th annual azalea trail kicks off next weekend. i've lived in houston for over ten years now and have yet to go on the azalea trail. maybe this year. all ten of the tulipa clusiana var. chrysantha that i planted in the front bed are up. this is a very good thing since i had started to worry that the squirrels had feasted on all of them. it's a beautiful day outside, so i should go out and enjoy it now. one day last week our beloved dogs decided they wanted to "help" me -- they picked up one of the still unplanted pots of queen's rain lilies (zephyranthes reginae) and dumped the contents in the middle of the yard. not liking the spot the dogs selected -- too likely to be trampled by cavorting dogs -- i divided up the bulbs for planting elsewhere. there were, in fact, 19 bulbs of varying sizes in that one pot (the second pot is still unplanted). since i like to diversify my risk, i put bulbs in spots with a variety of light / soil / moisture conditions. eventually (hopefully) i'll be able to say with some degree of authority where they are most successful. Like Z. citrina, this species happily self-sows and multiplies into thrifty patches. A handful of seed is all that's necessary to start a thriving population. 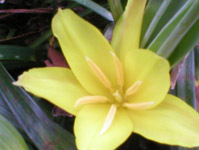 It's one of the most rewarding rain lilies for Southern gardens and flowers steadily from early summer till frost. Z. reginae seems quite hardy to cold. i'm looking forward to seeing these in bloom. (5) under the sunroom window in front of the narcissus "petrels"
* this is an approximate representation of the tulip layout along the front walk -- definitely not to scale. the tulips are planted in with the existing liriope. Tulipa kolpakowskiana. i was pleasantly surprised today to see two species tulips blooming along the front walkway - tulipa kolpakowskiana. fortunately, the rain stopped long enough for them to open fully and me to take pictures. now that the rain has started again, the flowers have closed. there are also -- or were, until the rain resumed -- seven crocus blooming in the yard. Raised Bed Layout. a more-or-less accurate representation of the plantings in the raised bed. yes, it really is this haphazard. it started out being neat and organized, but as plants lived (and died) i just stuck more in the empty places. and darin keeps buying rosemary plants that i must find places for. i used a nifty freeware application -- room arranger -- to create the graphic. Changes. added a new garden blog link over on the right - 'talking dirty' is the journal of a gardener in mckinney, texas. and i added a weather sticker thingie on the bottom of the left sidebar. got the idea after seeing it on talking dirty's site.